FROM a distance, they’re often mistaken for yellow plums, peaches or even miniature oranges. and it’s maturing into quite a delicacy among local expats and tourists. 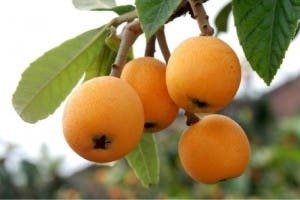 Known in English as the ‘loquat’, or ‘medlar’ fruit, these yellow-orange-coloured gems grow on a tree with fragrant white flowers. Although the skin can be eaten, it is the succulent flesh which offers all the juicy sweetness and vitamin-rich goodness that is sought in a tropical fruit. Perhaps the only inconvenience is the handful of hard stones inside which make the fruit rather messy to eat as a snack. In fact, the pips and young leaves are mildly toxic and, eaten in quantity, the fruit has a gentle but noticeable sedative effect, which is why it is so often used in more adventurous ways. Chutneys, jellies and jams are favourite ways to showcase the nispero’s versatility but it doesn’t end there. Gazpacho, upside-down cake and tropical crumble are other great ways of eating these orange jewels. They can also be poached or used to make wine or a simple pie or tart filling. Home growers like to cook, peel and stone the fruit before freezing them into portions with their juice. When defrosted, they can be used as syrups, sauces for desserts or simply eaten as they are. A great source of the dietary fibre pectin, rich in flavonoid antioxidants and bursting with vitamin A and potassium, the nispero is ideal for those trying to keep their cholesterol levels down and helps control heart rate and blood pressure. Try out this delicious recipe for nispero upside-down cake and let us know what you think. For the topping: melt the butter and mix with brown sugar. Arrange loquats on a greased pan with cut sides down. Then pour the melted butter with the brown sugar over the fruit. In a bowl sift together flour with baking powder, baking soda, salt, and cinnamon. In another bowl, cream butter with granulated sugar until smooth. Then beat in vanilla and eggs. Combine dry ingredients with the mix, then add the milk and beat. Pour the mixture over the loquats. Bake in the oven for 40 minutes or until a toothpick comes out clean. Eat while warm. Even more delicious topped with a scoop of vanilla ice cream! When Mountain biking, and low on energy, this fruit was very welcome on the mountain tracks from Ojen to Tollox. You can’t beat clean fresh and free fruit from a tree. My mum used to pick blackberries every year, now in Morrisons supermarket they cost £2 for just 300 grams.